Here at Morocco Accessible Travel Consultants, we want to create differently. So we did. Using a Joelette Trekking Wheelchair, you have the opportunity to explore what once was inaccessible. Come explore the historical and unique architecture of Aït Ben Haddou. A well-preserved ksar (a group of earthen homes with high walls surrounding) in Southern Morocco gives an exotic excursion within driving distance (albeit a bit of a long drive!) of Marrakech. This full-day excursion will take you to the filming site of many major motion pictures such as Gladiator, Game of Thrones, and Son of God, to name a few. You’ll depart from Marrakech after an early breakfast at your hotel. Drive across the rugged and majestic Atlas Mountains along the road of 1,000 kasbahs. Arrive at Aït Ben Haddou for a 2-hour tour of the ksar. Depending on your preference, you can enjoy lunch before or after your tour of the ksar. Afterwards, return to Marrakech in your private transport in time for dinner. Aït Ben Haddou is generally not accessible. 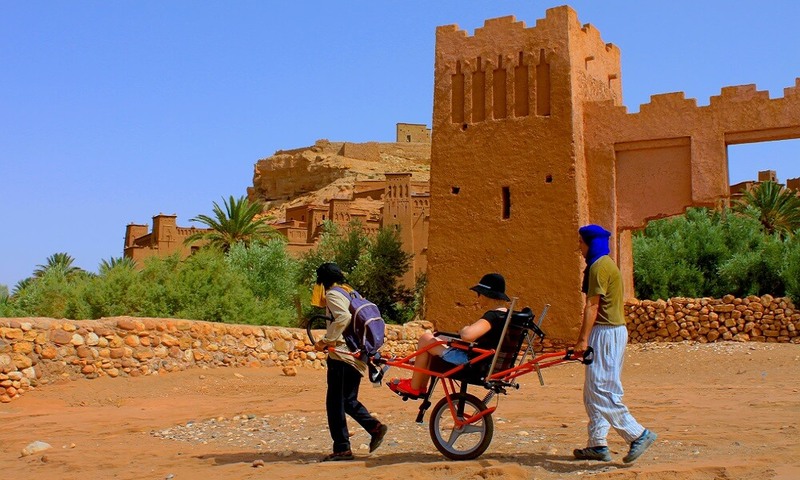 However, with the Joelette Trekking Wheelchair and 2 assistants, exploring Aït Ben Haddou is made accessible to our clients and their families. This excursion is approximately 10-12 hours long including driving time from Marrakech. The drive to Aït Ben Haddou is approximately 3.5 hours over the beautiful Atlas Mountains, along the road of 1,000 kasbahs. Feel free to ask your private transport driver to stop along the way for you to take pictures and really take your time to enjoy the scenery along the way!